An educational, not-for-profit organization, incorporated in the State of New York. Our purpose is to provide educational and cultural programs about American Indians, especially the Haudenosaunee, or Six Nations of the Iroquois. 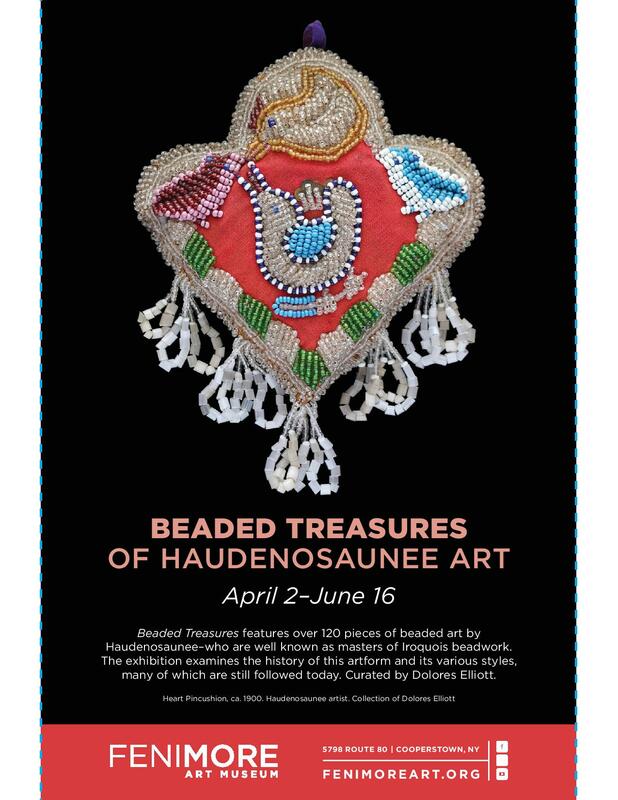 BEADED TREASURES OF HAUDENOSAUNEE ART features over 120 pieces of spectacular Iroquois beadwork created between 1850 and 1950. The exhibit opens at the Fenimore Art Museum in Cooperstown on April 2nd. and closes on June 16th. The museum is located at 5798 State Route 80 in Cooperstown in central New York. The 2019 International Iroquois Beadwork Conference (IIBC) will be held September 13-15 in Niagara Falls, Canada. Presentations, workshops, beadwork competition, and other activities will take place at the Niagara Falls History Museum. Sam Thomas's exhibit of beaded doors taken from Canadian residential schools will be featured. Hotel facilities are nearby. Attendance is limited. Further details will be coming in the next month. Volume 13 of Dolores Elliott's Iroquois Beadwork series has been published. Iroquois Beadwork Volume 13: Morgan, Polk, and the Erie Canal This 21 page publication is a compilation of three essays based on power point papers presented at conferences in the last three years. LEWIS H MORGAN AND IROQUOIS BEADWORK describes the important role played by Morgan in the promotion of early beadwork. He can be considered the "Father of Iroquois Beadwork." The essay on THE POLK PURSE illustrates how important Iroquois beadwork was in diplomatic circles in the 1840s. IROQUOIS BEADWORK, NIAGARA FALLS, AND THE ERIE CANAL describes the importance the 1825 opening of the Erie Canal was in the creation of a market for the earliest Iroquois beadwork. You may order publications by mail or online with a credit card. To order by mail: Download an order form in PDF format for all publications. To order online:Visit our online store. Note to Canadian customers ordering online: Our credit card service requires a US zip code. If your credit card account billing address is in Canada enter 00000 (five zeroes). This should bypass any problems. Iroquois Beadwork Volume 1: A Short History features over 200 full color pictures of beadwork and gives a short history of Iroquois beadwork. An illustrated time line shows examples of the major traditions of beadwork over the last 200 years. It also contains a list of publications for further reading. Iroquois Beadwork Volume 2: An Identification Guide contains 26 pages of full color pictures of beadwork classified into over 80 defined types of beadwork such as heart pincushions, canoes, birds, needlecases, urns, strawberries, and fist purses and how they differ in the three main beadwork traditions: the Mohawk, the Niagara, and the Thomas-Hill. Iroquois Beadwork Volume 3: An Exhibit, Conference, And More reports on the 2009 Rockwell Museum of Western Art exhibit, "Sewing the Seeds: 200 Years of Iroquois Glass Beadwork" which featured over 300 pieces of Iroquois beadwork. This volume also includes information about the first Iroquois Beadwork Conference which was held in September, 2009, and was attended by over 50 admirers of Iroquois beadwork. Also included are essays on purple pillow pincushions and floral black bags. Iroquois Beadwork Volume 4: Canoes and Horseshoes Canoes and horseshoes are two of the many forms of Iroquois beadwork. Out of the dozens of different types of Iroquois beadwork developed in the last two centuries, these two forms are described together in this publication because they share several characteristics. Iroquois Beadwork Volume 5: Strawberries, Birds, and Trees Three of the over eighty forms of Iroquois beadwork are featured in this twenty page guidebook. Strawberries, birds, and trees are included together because they share the characteristic of being three-dimensional; they have no defined front and back so they can be viewed from all sides. Over one hundred pieces of beadwork are pictured. Iroquois Beadwork Volume 6: Match Boxes and Whiskbroom Holders Wall hangers made to hold items of daily use are featured in this twenty page guidebook. Match boxes to hold stick matches used for lighting stoves and lights in pre-electric homes and holders for whisk brooms are among the most creative forms of Iroquois beadwork. Other minor forms of wall hangings such as scissors holders are included. One hundred colorful and often amusing pieces are pictured. Iroquois Beadwork Volume 7: Needlecases and Cardcases The forms of Iroquois beadwork featured in this twenty-page guidebook are utilitarian pieces that are both functional and portable. Unlike the majority of the forms of Iroquois beadwork which are meant to hang on a wall, needlecases and cardcases are small and can be carried in a pocket or purse. Most needlecases and cardcases are beaded in ornate designs. The majority were made in the 19th century but there has been a recent 21st century revival in the creation of needlecases. Iroquois Beadwork Volume 8: Portraits in Beads Talented Iroquois beadworkers have been creating beautiful beaded art pieces for over two hundred years. Interest in Iroquois beadwork has varied over the years both in Iroquois communities and among the general public but has never been as high as it is in the early twenty-first century. Much of this increase in popularity is due to the work of five women who are profiled here: Lorna Thomas Hill, MaryLou Printup, Dolly Printup Winden, Ann Green, and Tessie Hubbard. Iroquois Beadwork Volume 9: Picture Frames Picture frames were among the first types of beadwork created by Iroquois beadworkers. As early as the 1860s Mohawk picture frames were made to display the earliest small cartes de visite photographs available in the 1850s. Volume 9 traces the evolution of picture frames throughout the 19th and 20th centuries up through 2016. Pictures of historic exhibits and beadwork created at the 2016 International Iroquois Beadwork Conference are included in this 20 page guidebook. Iroquois Beadwork Volume 10: Boxes The Iroquois beadwork featured in this publication are called box purses because many have the word BOX beaded on their lids. They were meant to be carried. Boxes usually have hanging loops across their bottom edges. Most made before the mid-1890s have short clear bead loops while those made from then to 1917 feature prominent loops with heavy cut tubular beads called sprengperlen. Some boxes have no handles or fringe and may have served as trinket or jewelry boxes. Boxes are not common forms of Iroquois beadwork and make up only about 3% of all Iroquois beadwork. Iroquois Beadwork Volume 11: Heart Pincushions Pincushions in the shape of Valentine hearts are the most numerous of all Iroquois pincushions. They were first made by Seneca beadworkers in the first half of the 19th century and now, in the 21st century, they are made in all the Iroquois beading communities in the US and Canada. This 26 page guidebook pictures hearts made over the last 200 years. Iroquois Beadwork Volume 12: Trilobe Heart Pincushions Trilobe heart pincushions are on average larger and with more intricate beadwork designs than the simpler Valentine shaped hearts. This guidebook pictures some 150 trilobes which display some of the most interesting designs of all Iroquois beadwork. A catalogue for the exhibit of the same name The exhibit was originally at the Longyear Museum of Anthropology, Colgate University. The catalogue was compiled by Carol Ann Lorenz, the Senior Curator of the Longyear Museum. The 26 page full color publication includes 57 photographs of Iroquois beadwork in a variety of shapes and functions. Pincushions carry colorful images of exotic animals including elephants and unicorns and purses that picture lions, a camel, and a pig. A hot pink whisk broom holder shows a green hippo with a yellow dog chasing a blue cat. A trilobe heart shows four baby birds peeking out of a bird’s nest. One purse depicts a FOX on a BOX and other shows a green bear. There is also a green cow with the date 1910. There is a 6000 word essay by Dolores Elliott outlines the history of Iroquois beadwork in the communities of the Six Nations in the US and Canada. Samuel Thomas’ Beadwork Workbook has been reprinted. Click here for an order form.